The Stage 2 EX HP76 has a lightweight hammer action keybed. 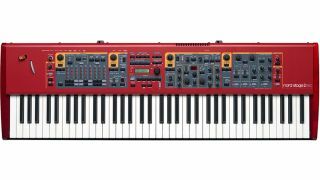 MUSIKMESSE 2015: Nord has expanded its Stage 2 line with the introduction of three EX models. The EX 88 offers a fully weighted 88-note hammer action keybed, the EX HP76 has a lightweight hammer action keybed, and the EX Compact has a 73-note semi-weighted waterfall keyboard. Other than the differences in size and keyboard type, all three models are identical, with each offering 1GB of memory for the Nord Piano Library. There's also a brand new factory soundbank that features both new sounds in the Piano Library and an "updated and refined" selection of sounds in the Nord Sample Library. You can find out more on the Nord website. The Stage 2 EX models will be shipping in May, with pricing still to be confirmed.